It is a perfect time to assess your kitchen as holidays approach and preparations are made for celebratory feasts. What do you like about how your kitchen facilitates your desires? Does it have adequate storage with easy visual and retrievable access? Is there enough counter space? Do you need another sink or oven? How do you wish it would function better? Is it big enough for more than one cook? Is the refrigerator big enough? The cooktop to your style? What do you not like about it? Those are questions to answer to customize it to how you like to prepare food and entertain. The next part in redoing a kitchen, is making it current to what homeowners want in their kitchen. Here are four of top trends in kitchen remodeling. An open concept kitchen. The layout should make the home seem larger and flow well. Islands are “single level.” A focal point and open shelving provide depth and are used for matched dishes that complement the color scheme of the cabinets and backsplash. Ample lighting. A part of the attraction of an open concept kitchen is getting more natural light sources reaching into the home. Statement pendants can sum up your style, e.g. industrial, modern, artistic. Painted shaker style cabinets. Whites and grays are “in”, and the non-neutrals of blues and greens are gaining in popularity for those who want to go bold. Kitchen islands are often a contrasting color for a pop of personality and interest. Marble look countertops.. Advancement in quartz color pigmentation can make them look like natural stone. They are more stain resistant and more durable. Break up the visual space of flooring to cabinet to countertop to backsplash with colors that provide contrast. 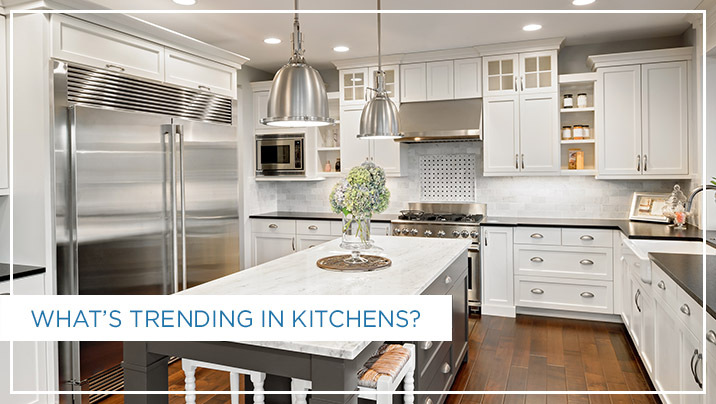 Knowing what is trending will help keep your kitchen current for many years to come.